Karameikos is the setting for King’s Festival, but it is not the semi-Slavic Karameikos of Night’s Dark Terror, it’s a generic fantasy good kingdom. I won’t say high fantasy, because that implies a certain amount of grandeur and wonder – 1989 TSR Karameikos has none of this, it’s a Grand Duchy, part of a larger empire, ruled by a beloved good prince, who’s only real enemy is an evil baron ruling a nearby duchy. Demi-humans live within the communities of humanity without strife and generally the world presented in B11 is vaguely sketched, highly ordered and without much moral ambiguity. The characters are assumed to be adventurers, seemingly a class of wandering troubleshooters who deal with problems too dull for the local authorities. The center of town life appears to be a shrine to an unnamed, but lawful deity and festivals focused around this shrine. The party is in town for on such Festival, The Kings Festival, and during the night the shrine is raided and burnt by orcs who also carry off the locale priest and kill a pair of townsmen. The town of Stallanford is also dull, it undoubtedly has cobbles in its streets and its inn serves a nice beef. 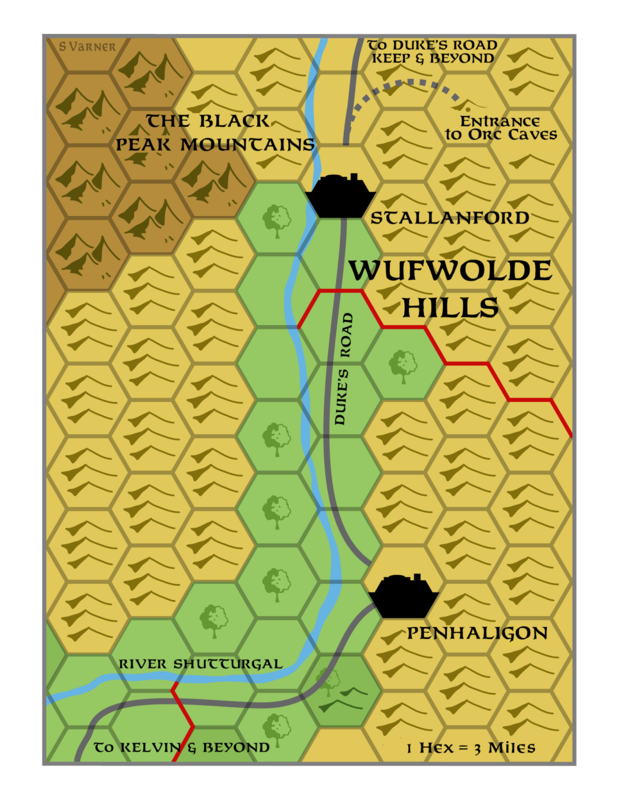 The party is encouraged to set off after the orcs and a local guide (who won’t enter the orc lair) tracks the marauders into the hills leading the party to an old cave. The lair is explored, the orcs slaughtered or defeated and the priest rescued after revealing a secret door leading down into an old tomb below the orc nest. Beyond the secret door is another small dungeon, which includes a few monster worms, a carrion crawler, and then some undead lead by an evil priest who is looting the tomb. The introductory notes are not bad at discussing the mechanical and social aspects of running a game of D&D, though they do not touch on campaign creation, which B11 sorely lacks. They are more cautious and tentative then similar remarks in earlier ‘B’ series modules, but they cover a lot more ground, discussing player behavior and urging GMs to respect player agency while using the game world’s own logic to ratchet down on individual disruptive players. While not fully embracing the attitude of allowing player decision to create the adventure (they still encourage finding ways to get the party to the ‘right’ dungeon). I also enjoy the way that Kings Festival attempts to use alignment as a key factor in complicating the game. Alignment is supposed to mean something to the characters, though it is described as mostly a set of prohibitions without any benefit or in game explanation. To some extent this is TSR pushing back against accusations that D&D encourages amorality or rewards villainy, but I think there may be something here, especially in a game that is focused on a more medieval world where faith, social hierarchy and loyalty to a liege have real meaning. This could be an interesting mechanic to play with, but sadly King’s Festival only uses it as a bludgeon to keep players from being sadistic. In my mind the game world’s reaction and the GM’s descriptive powers are better at keeping players from being sadistic. The treasure descriptions are excellent in King’s Festival, everything is a pile of furs or jewelry with a few descriptors rather then simply coins. There are caches of coin, but they aren’t the rule, and the descriptions of treasure are nicely minimal but evocative. In general the treasures are simple and in keeping with King’s Festival’s awful blandness, but they are far better then anything else I’ve seen in a B-Series module. Even the magic items (tastefully sparse) get a few world of description beyond their bold texted effects. The King’s Festival is combat focused, from the introduction that speaks of characters battling the forces of chaos rather than finding a fortune the implication is strongly that the game is about slaying monsters. While the introductory advice properly discusses reactions and monster morale (including several notes about how slaying monstrous captives or non-combatants is a chaotic act, and something that lawful characters must prevent) there’s a very strong emphasis on the tactical aspect of the adventure, which sadly is managed in the classically worst way. The orcs appear highly militaristic and organized but calmly wait in their chambers to be slaughtered in small packets. With the beasts and undead in the lower level this makes some sense, but with an orc raiding party expecting reprisal I want to see an order of battle and some tactics. While the ‘Dungeon of Bystander Effect’ issue is common and easily remedied, B11’s worse sin is that is just dull, from the monsters to the setting, to the minutia, it’s dull and unimaginative. 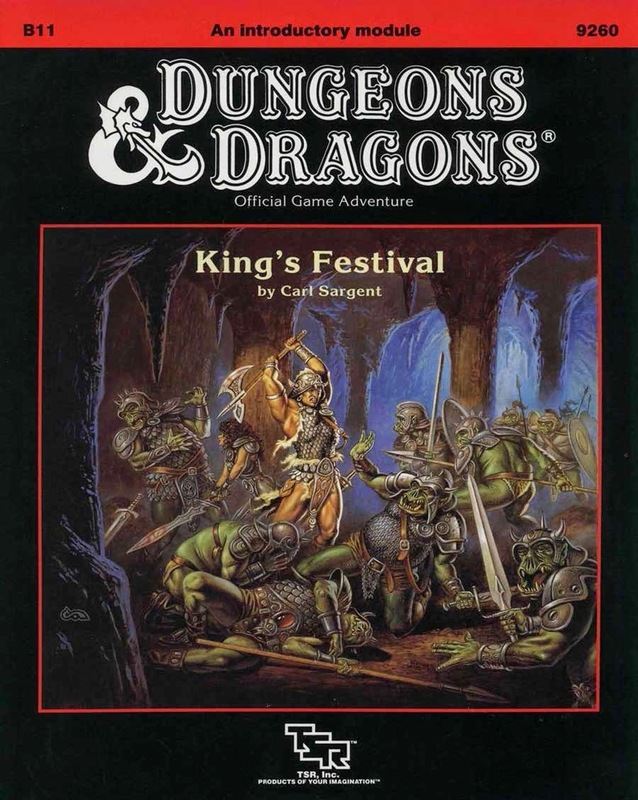 King’s Festival is a flavorless pablum of D&D standards: bad orcs, good townsfolk, dungeons without an ecology or meaning. There are some nods in the direction of evocative setting in the form of treasure description, new monsters, and a few creatures with some kind of purpose that effects their actions, but in the end King’s Festival is an unimaginative one page dungeon spread over many pages and without the sort of evocative detail that would justify such expansive writing. At one time I was thinking about writing the worst adventure module possible, to be titled “Some Orcs in some Rooms”, and while B11 at least has some nice touches (treasure description and some nod towards tactical problems/complexities and a refreshing lack of Mimics) it is far too similar to that ‘worst adventure’ I had in mind. King’s Festival is very detailed, it seeks to explain every nuance and area so that a GM need not add anything, and ultimately cannot add anything, and perhaps this is what limits its scope and adds to its dullness. The problem with the totalizing method of adventure design is that while it may create the appearance of a neatly bounded play experience, with every possible box checked, every object described and possibility enumerated this neatness is not necessary or desirable in a written adventure. Table top games are some sort of improvisational story building, combined with a strategic game of chance. The game can shift in either direction depending on system (even within a fantasy setting), with something like Torchbearer on one end, where fitting actions into a seamless story is the goal of the game, or a tactical number crunching, something like Games Workshop’s Mordenheim or allegedly 4E D&D. Still in either of these cases, if the players are to interact with the game world beyond moving tokens and making rolls (not that a purely mechanical game is bad), player input will at least focus on certain aspects of a game world and the descriptions of the world will emerge from player understanding. I believe that B11’s attempt to lay everything out, limit strange possibilities and create a fully prepared adventure led to its tiny scope and relative lack of interesting content. There is nothing wondrous or exciting about invading a lair of degenerate chaos soldiers to rescue the local holy man, the whole thing feeling washed out and dull, despite some good individual encounters. However much B11’s totalizing is responsible for its dullness, it’s certainly responsible for its tiny scope, and really this scope is a problem. While almost every room of the small dungeon has an encounter – combat with monsters usually, it’s still a tiny place. Some empty rooms and variety would be good, beyond just an endless series of fairly easy fights, and this would also allow a larger complex. Indeed if the orc hole is the first level of some sort of ancient barrow complex, adding a few empty areas that give the party an idea of what to expect below, or the space to engage in tactical shenanigans with a less passive group of orcs would be beneficial. Karameikos is just a name, and I don’t feel like buying the Gazetteer, but it’s an evocative name – sort of Slavic and Greek at the same time. The first idea is to make Karameikos a kind of renaissance Albania, with Imperial overlords based on the Ottoman grating against a restive but mostly passive populace. One could bend it a little more, Duke (or Voivode) Stephan is a pretty smart guy, and he is trying to use ritual and problem solvers to keep the Imperial Army in its barracks, minimizing resentment and extracting tribute efficiently. This way one needn’t turn Karameikos into some kind of hinterland or post plague, fallen empire points of light campaign, but rather a place where insurgency simmers and the party must behave appropriately to prosper (that is they must follow certain strictures and standards of behavior that both prevent offense and keep up the Imperial dignity). Failure to follow these codes means Imperial Sanction or making oneself a target for rebels. In this context the party is a group of these troubleshooters, indigenous lesser nobility most likely, told they can earn Imperial rank, trust and wealth by making sure things go smoothly in the townships as long as they don’t call on Imperial intervention. Right now this means coming into town, putting on a good show of nobility, presiding over the Kings Festival and then collecting the tribute of teenage candidates for the Imperial Janissary Corps. Obviously walking off with a chunk of the towns strapping youth is a source of resentment, and the town elders will be very punctilious about their rights and demand that the tribute is provided at the Kings Festival under certain conditions. Arriving in the town there’s a festive feel, but an undertone of malice and tension, as if the whole place is ready to explode. Indeed some of the local hotheads and grieving parents have made a deal with the local guerillas/bandits/religious fanatics and intend to derail the festival and tribute, not realizing that this will result in the savage Imperial light cavalry massacring and enslaving the entire town several months later. The priest is a voice of reason and authority though, an educated fellow who understands just how powerful, merciless but generally hands-off the Empire is and he has kept the town peaceful. The raid of course disrupts the festival, and the fanatics can’t resist burning the shrine, kidnapping the priest and murdering a few collaborators (or folks who happen to be in their way). Reskin the orcs as Karameikosian nationalist hold-outs, grown nasty after ten years of defeat, flight and guerilla warfare. Better yet, they’re not just run of the mill guerillas, they are the battered remnants of a monastery of fighting monks, some kind of Templars who’s ideals have been long drowned in an ocean of blood. Worse still they recently came under the influence of some kind of mystic (the evil priest), a Rasputin like figure with an entourage of “silent monks” reeking in their holy filth (ghouls – they are freaking ghouls) until “Karameikos is Free”. The Mystic has the fallen Templars raiding old barrows (in addition to their normal round of depredations and kidnappings) to find artifacts of his ancient cult. The cult of course does want to free Karameikos from Imperial rule, but it’s an ancient thing, dedicated to chaos and giant worms (any excuse to add purple worms to a campaign is great). This worm cult makes the lower level of the barrow more fun, as the non-worm enemies can be reskinned as worms (and mostly it's worm enemies already - including the beloved carrion crawler) or the creepy undead monks of the evil worm priest. This set up does a lot of things, it adds urgency to the scenario and sets up some campaign defining options: it allows the party to make a moral choice between a good cause with bad methods and a dubious cause with good methods, and creates a clear bread crumb trail (a worm cult, everyone hates worm cults) for the party to potentially follow (they can always go back to Stephan, get some praise and get sent off to troubleshoot somewhere else). Finally it allows one to do start a directed sandbox campaign without breaking one of the more interesting (and one of the only) setting elements in King’s Festival, the setting as peaceful land where the moral content of player actions are important. For example, with the orcs as Templars, they are simply bad men – likely mutated by worm worship, but the issue of if the party should slay the noncombatants (woman and children) found with them is no longer something that any players I know will have to wrestle with. One can make these folks kidnapping victims, or secret worm cultists to make that decision either easier or harder, but either way it looks like Stallanford (why a vaguely German/English name in fantasy Albania?) is getting some new populace. After thinking of how I’d run King’s Festival I’m kind of enamored with my solutions, but at the same time I don’t want to suggest the module is remotely worthwhile. It’s too small in scope and uninteresting to be of use. If a GM absolutely needs a small vanilla orc lair to drop on a sandbox map, perhaps it’s useful, but since the adventure will need to borrow everything evocative or fun from that GM’s existing setting, why bother. The first few pages are a nice primer to game management, but they aren’t something that isn’t available elsewhere. * This raises another question which I like to call “What is an Orc Anyhow?” - properly subject of a future post. Man, write that module you just wrote. PC Janissary Class dude! Thanks for the vote of confidence, but I've got a lot of other stuff in process before I dart off too fix old TSR product. I agree with your assessment, both good and bad. However I have run this probably five times, and it has been a fun success each time. You have to bring the passion. There is so very little in the adventure. By when you do, it's solid and workmanlike. Certainly, b11-b12-b10 is a fantastic arc of discovery about the cardboard cutout kingdom and forces at play. I don't doubt B11 can be fun to run, but it's not as if one needs a module to run it. Five minutes and one piece of paper and I suspect, you, me and any GM could write an orc cave at least as good. Plus while the advice is decent the in module examples are poor. Hey gus, a cheeky request ......... could you do one of your reviews for B12 the Queens Harvest? I'm planning on running B11, B12 and B5 for my kids and B12 is the only one you havnt reviewed. I'm really appreciating your advice on improvements to the modules and plan on implementing all of them. I have read B12 but never finished the review. It's a mediocre module much in the same vein as B11, moralistic but fundamentally shallow. The most interesting thing about it is that it's a decent castle siege before in becomes a poor dungeon crawl. OK well thanx for the speedy reply. I'm sure I can beef the adventure up myself. I don't need to make it too complex as this is my kids first roleplaying experience.